Daryl Gregory is one of favorite modern writers. Every time he has a new book come out, I know it will be unlike anything else he’s ever written. Like China Mieville, he’s a speculative fiction genre-hopper. Or genre-hybridizer? Mieville seems to value syrupy prose and mind-blowing ideas over character (Not that there’s anything wrong with that. Seriously.) Gregory’s books, on the other hand, are bright and personable—and surprisingly heart-warming, for stories that involve zombies, disfigurement, and demonic possession. And some of Gregory’s ideas are just as trippy as Mieville’s, which is high praise indeed. For his latest, Gregory has tried his hand at young-adult fiction. Not as interested in that. Young-adult fiction based on Lovecraft. 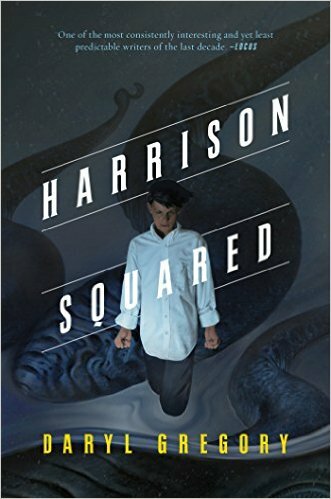 The book is called Harrison Squared. Right off the bat, I have to give Gregory props for introducing a teen protagonist, Harrison, who is an amputee. There’s not enough books out there (young-adult or otherwise) that have a main character who is ‘differently abled’ in some way, unless that difference becomes the main crux for the story. Harrison’s leg is just something he deals with; it doesn’t define him. And he’s not particularly angsty or self-conscious about it, which is refreshing. Harrison is a well-rounded character. He’s supernaturally gifted. He has one parent who died mysteriously. He’s grappling with some anger issues. And he’s just enrolled in a new school that is very, very strange. Does that sound like any other YA protagonist you can think of? OK, Harry Potter lost both his parents in mysterious circumstances—but there are some definite similarities. In fact, if you are a Harry Potter fan, and you’re looking for something similar but just-different-enough, I think you’ll enjoy the happenings at the Dunnsmouth Secondary School. Here’s the basic set up: Harrison and his mother, a marine biologist, have moved to the town of Dunnsmouth, on an isolated and eerie section of bluffs on the Maine Coast. On his first day at his new school, Harrison is introduced to a half-dozen strange characters. Perhaps none are as strange as the students themselves, who are all homogeneously somber, antisocial, and goth-pale. At first, Harrison’s classmates seem to be a cross between the Addams family and the Children of the Corn. But looks can be deceiving, and the children of Dunnsmouth are friendlier and more sympathetic than they seem. Which is good, because Harrison is going to need all the help he can get. Soon he is wrapped up in the town elders’ plot to unleash their cult’s ancient ocean god upon the world. Holy Cthulhu, Batman! My favorite parts of the book are the descriptions of Dunnsmouth Secondary and its faculty. There’s the trio of lunch ladies, hunched over their cauldron of stew, and sharing one pair of glasses—like the witches of Greek mythology (or of ‘Clash of the Titans’). There’s the swim coach, who is described like some kind of were-walrus. There’s the love-lorn (and spaced-out) Nurse Mandi. Then there’s Harrison’s friend Lub, whose strange affinity for Aquaman is NOT the strangest thing about him. The characters are creepy and amusing. Another stand-out is Harrison’s glamorous aunt from Manhattan, who is sharp-tongued, smugly used to getting her way, and also surprisingly magnetic and charming. Overall, I felt the plot was pretty straightforward. Perhaps that was a result of Gregory writing for the young-adult market. There were a few surprising developments among secondary characters, and a few narrative devices to create mystery and suspense. And the end had a bit of a twist to it that I wasn’t expecting, which sets up nicely for a possible sequel. If you’ve never read Daryl Gregory’s stuff, and you’re not that into young adult, I’d suggest The Raising of Stony Mayhall, and Pandemonium. Interesting review, James. You’ve introduced me to a new writer to explore. Thanks! Thanks! Hope you like him. Sounds like an intriguing author…I’ll have to look him up on Amazon. So many great authors, so little time! Anyway, this looks like a really fun read, and as someone who has a love-hate relationship with YA — leaning heavily toward “hate” — I might need to give this one a shot. Hopefully it’s better than the last (only other?) Lovecraftian YA book I’ve read, the not-as-funny-as-promised Awoken. Hope you like it if you give it a try! Yes, I’d love to see more sort-of mainstream Lovecraft stuff—instead of so… many… zombies! I also tend to roll my eyes at a lot of Young Adult narration. But I really enjoy New Adult. What a difference a few years make, I guess!